The Archdiocese of Louisville’s Office of Mission Advancement is encouraging those considering a gift to the 2016 Catholic Services Appeal to view a brief video about the appeal. The video, which is just under seven minutes, illustrates a few ways the Catholic Services Appeal aids dozens of ministries, programs and people throughout the Archdiocese of Louisville. The 2016 appeal seeks to raise $3.5 million. 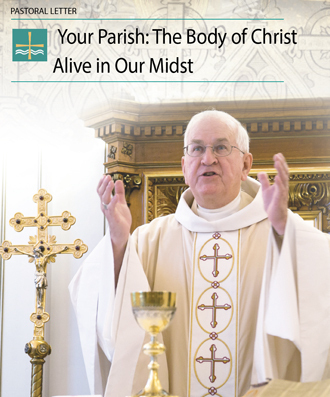 Archbishop Joseph E. Kurtz is featured in the opening and invites past and potential donors to “bring Christ to others” by making a gift to the appeal. “In your daily life you bring Christ to others but in a very concrete way, through the Catholic Services Appeal, you are able to join with others throughout the archdiocese in bringing Christ to others,” he said. He notes several of the ministries supported by the appeal, such as educating future priests, supporting retired priests and the numerous ministries available to the poor and vulnerable through Catholic Charities. Later, when Beattie was searching for a job, she came across a flyer for the Common Table program, which is sponsored by Catholic Charities. The eight-week program provides students with culinary training and job readiness skills. Common Table also assists students in finding employment in the food-service sector. Beattie, who graduated from the program in April, was able to secure a job just days later with the Brown Forman Corporation. Also featured in the video is David Farrell, a seminarian from St. John the Apostle Church in Brandenburg, Ky. Farrell shares part of his vocation story and discusses the direction and support he received from the Vocation Office. “It’s humbling to know that there are so many people throughout the diocese donating to CSA and making sacrifices to support not only my education but also my formation,” Farrell says. Father Wimsatt says that when the church gives, it’s on the behalf of the people in the pew. Visit www.archlou.org/csadonate to view the Catholic Services Appeal video and to learn more about the ministries and agencies that benefit from the appeal.